Today, I am welcoming Amylee Udell from Productive Mama to the blog. Amylee is sharing how to prepare for back to school when you have children in school and you also homeschool. If you are a mom with school aged children, you will find these prep tips very helpful in making your first days back to school less stressful. I have homeschooling down pretty well. There are always adjustments, new classes to teach in our co-op, distractions and more. But I’ve become pretty adept at handling them. Then my oldest started going to school so I found myself managing school plus homeschool and THAT challenged me. Now my brain had to continue on the homeschool track while adding this other new track that was brand new to everyone. I found my mom brain pulled in very different directions! This year, I feel more prepared, having weathered two school + homeschool years and becoming more familiar with the school seasons and the ebb and flow that comes with them. 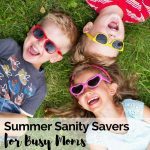 This year I have a plan to help prep for school + homeschool that will help me feel like I’m on top of things from the get-go and not trying to catch up before we even get started! Here’s a little about us and then I’ll outline the plan. The school year here starts mid-August. Our co-op starts early/mid-September for my kids’ grades, but we start homeschooling with the school year. My oldest children have Kung Fu year round, which at their level is a 3-4x/week commitment. The youngest recently started cheerleading, which is intense for a few weeks at a time and then we’ll be done for awhile. We are very involved at church, as well. So we’ve got a full and busy load of activities and the oldest’s high school is also intense, with studying being the most time-consuming activity. About 2-3 weeks prior to SOS (Start of School)/1st of August, I do a Back to School clothing refresh. I don’t do a HUGE clothing restock at this time, as I purchase when deals arise. But I also know my teen has some fashion concerns. So I typically offer a set amount of money and let her choose a thrift store or Target to replenish any needed items beyond the boring basics I am willing to provide. She usually chooses jeans, shorts that meet dress code, a few t-shirts and perhaps undergarments. And shoes. She has a shoe thing that I can’t support to her liking. The starred items above are ones I can start making and then put into the freezer. I’ll enlist her help in making big batches of each to freeze so that at night we can grab them from the big freezer and either defrost (leftover pancakes), bake up (muffin batter) or move to the kitchen freezer (smoothie packets) the night before so they’re ready to go in the morning. Need some more breakfast inspiration? Checking school books and supplies, set items on the school shelf (maybe you have baskets, bins or piles) for each kid. showing each kid what’s coming up. Familiarizing myself with the material, as well. I do not plan out an entire semester day by day. I keep moving forward and show each kid what’s expected each day. Purchasing any paper or folders or binders we might need. Purchase any curriculum/teacher guides still needed for the class I’m teaching. Let parents know what purchases are needed for the class. Purchase what my kids need for their classes. Plan out a GENERAL lesson plan through the first semester. This will be adjusted as we go, but if I have a guide and specifics for the first month of classes, I feel prepared. I’ll use down time at Co-op to plan ahead for future lessons beyond that, always working a few weeks ahead. I actually do this ASAP or a little earlier than this but I enter ALL co-op dates and related activities into the calendar since this impacts the lesson planning. Ongoing with a focused effort for 2 weeks before SOS, I work to stock the freezer. Stock the freezer with pre-made freezer meals. With extracurriculars, our evenings are busy and I’m often not home to cook a meal at dinner time. I often make meals early in the day and keep them warm in the Instant Pot or crockpot. But on extra busy days (so, half my days, at least!) I love being able to grab a meal from my freezer meal stash and know dinner will take ten minutes to prep! Be sure to participate in my freezer meal exchange club in order to get at least 12 different meals, frozen and ready. I hate skipping ANY of our freezer meal exchange club sessions, but it’s so important to make the one at the beginning of the school year. In the week before SOS, I get the kids to put their rooms in order. Or try to. I tend to not hold my breath here. Back to school prep doesn’t have to be stressful. If I have basic plans for homeschool lessons, a few freezer meals stocked, baggies of snacks and quick breakfasts ready, all is right in the world. I know I’ll fall behind as things get busier, but if I can START out the school year truly ready, I feel I can do anything! For help with the day-to-day of getting you and your kids ready for each school day, check out some of Productive Mama’s printable checklists. There’s one for kids and one for moms. Both will help you end that morning chaos we dread. You know what I’m talkin’ about, mama. How do you prepare for Back to School? What’s your best back to school preparation tip?